It was the sixties last night at the Grand for the Magical History Tour — the annual Northfield Historical Society auction. See five dozen plus photos in the NHS auction 2006 album. Griff Wigley is a notorious local blogger and world-class crowd photographer. ..yes, THAT Dave, Dave Machacek. While I certainly want to promote the Day of the Dead celebration (Wednesday, November 1st, 6 to 9:30 p.m., at the Northfield Armory), it also seems like a perfect time to celebrate Dave. Editor's note: I just saw this while trolling through our local blogs. You can read the rest of Ross Currier's really interesting profile of Dave and his amazing work at ArtOrg by clicking through to the NDDC site or clicking on the NDDC blog at right. I was just updating pages for Northfield.org when I saw this breathtaking sunrise out my window. I risked the wrath of the cat by moving her from my lap, then shot this photo and e-mailed it to Northfield.org. Total elapsed time: 3 minutes, including apology to the cat and time to find the photo card gizmo for my laptop. That's how easy it is to share something on Northfield.org. Current Lt. Govenor Carol Molnau visited Northfield today, stopping by the Bittersweet Eatery and KYMN to stump for Gov. Pawlenty and the Vote Yes transportation amendment. Griff Wigley has pictures, links and lots more information. Sure, there’s a lot going on this weekend. But you might want to make time to catch the end of the run of “An Enemy of the People,” the Henrik Ibsen classic wrapping up its run at the Northfield Arts Guild Theater. I’m no theater critic, but this was a great cast relishing a great story – and one that seems “ripped from the headlines” despite its roots in 19th century Norway. The play focuses on the efforts of a doctor to alert the community to a pollution crisis and the opposition he faces from politicians and the press, even his own brother. As usual, one of the most enjoyable aspects of community theater is seeing friends and neighbors in a new light. Gabe Angieri, Ann Etter and Joseph Crippen (shown) handled the lead roles with ease. But there was another casting that added a little more bite to the political flavor of the play. Rob Schanilec plays the printer who publishes the local newspaper, a man caught between the reporters who want to tell of the pollution and the political powers who point out the economic disaster the city faces should the news get out. Dr. David DuBois, one of the country’s leading authors and researchers in the mentoring field, will address more than 100 youth mentoring professionals during the seventh annual Statewide Mentoring Conference in Northfield. Dr. DuBois will share valuable research and recommendations for sustaining the mentoring movement through practice and evaluation at the Carleton College Sayles-Hill Campus Center on Monday, October 16. The event, which is open to the public, begins at 8 a.m. in the lower-level conference room of the Archer House at Third and Division streets in Northfield. Coffee and refreshments will be served. The first Northfield Public Library Spelling Bee is over and a team from St. Olaf College claimed the championship. 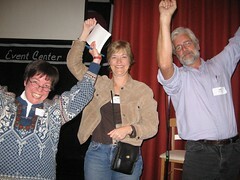 Griff Wigley who was at the event, reports that Maggie Odell, Roz Eaton-Neeb and Paul Zorn showed their Ole spirit -- and a mastery of Webster's -- as they beat some tough competition from all over town. Those are all the details I have, so if you were there, please feel free to add more info in the comments field below. We've got a photo gallery of the event and as usual, Griff had camera in hand, so you can see his take on the evening just by clicking here. 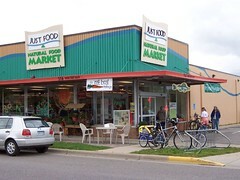 Just Food Co-op held a harvest festival on Saturday, September 23. Under threat of rain, they moved the celebration into the old Northfield Community Merchantile space, but many people still attended the event. Music, food samples, and art, composting and yarn-spinning demonstrations and information all entertained attendees. Northfield city workers installed new bike racks along Division Street in downtown Tuesday morning. The city worked with the NDDC and downtown businesses on this project. Photo courtesy of Alex Beeby. Congratulations to Jane Fenton, the grand prize winner in our 'Dinner on Us' membership contest. After 10 weeks of giving away dinners at restaurants throughout Northfield, we decided to give our final winner the option to choose the perfect dinner -- and we threw in $100 to pay for it. Jane says she plans to invite her friends over, order dinner from her favorite restaurant, Kurry Kabab, and let the fun begin. "I am the Director of community relations at Laura Baker Services and have been since last November. I’ve lived in Northfield since my first days as a freshman at Carleton College, slightly over 20 years ago. "I have two sons, Eddie Martin, a sophomore at the high school, and Cliff Martin, a sixth grader at the middle school. The three of us have appeared in several plays at the Arts Guild over the last couple of years, most recently “The Jungle Book.” I just competed in the 15K road race during the Defeat of Jesse James Days, and I finished, much to my delight. I visit at the Long Term Care Center at Northfield Hospital as a Pet Therapy volunteer with my dog Patch. I’ll be spelling in Thursday night’s spelling bee at the Grand, and will appear as part of a dance troupe in the upcoming cabaret at the NAG on Oct. 14. Fortunately in both cases, my sense of humor will keep me from dying of embarrassment in public." I took three photos at Northfield Liquor Store's Wine Club event at the Grand Event Center on Thursday night. 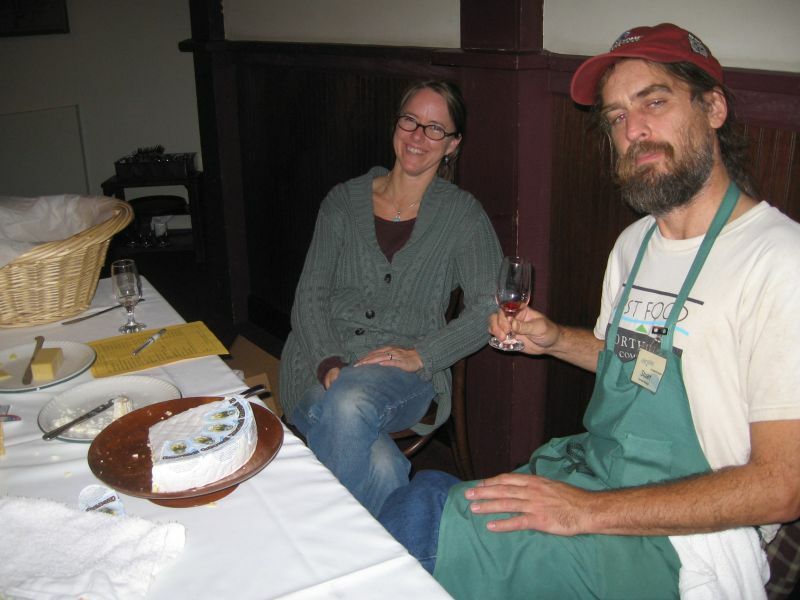 Left: cheeses were presented by Stuart Reid and Melody of Just Food Co-op, with baguettes provided by Brick Oven Bakery. The Northfield Historical Society and the Northfield Senior Center present "Daughters of the Game; Then and Now." Listen to Dorothy Mcintyre talk about the history of women's basketball in Minnesota. Then listen to Pat Lamb and Tammy-Metcalf-Filzen talk about the history of women's basketball in Northfield. This program will start at 7 p.m. at the Northfield Senior Center on Wednesday, Sept. 21. Admission is $2 for non-members and adults. If you have any questions, please call the Northfield Historical Society at 645-9268. Whew! The concessionaires are gone, the streets are open and we are free to move around town again. Not that we didn't have fun at DJJD, but . . .
Lots to do on this fall weekend. Friday night the new exhibit at the Northfield Arts Guild opens. "Melange" features the work of Rhonda Banks, Toni Easterson, Sharol Nau and Riki Kolbl Nelson. The opening reception is Friday night, from 7-9 p.m. NAG is also hosting 'Coffeehouse Writer's Night' on Friday at the Center for the Arts on Division Street. Local writers are invited to read their works in an open mike setting starting at 7:30 p.m.
We are proud to announce that our 10th "Dinner On Us" gift certificate is for $50 to the Contented Cow. Yes, that's 10 weeks of winners, enjoing 10 weeks of dinners at our favorite Northfield restaurants. And you can join them, just by joining us. But hurry, because this party can't go on forever. By becoming a member of Northfield.org you will be entered into the next Dinner On Us membership drawing. The deadline for this week is noon on September 17, with the winner being announced on Monday, September 18.